Stems: Erect, mostly single, simple or rarely branched, leafy, glabrous. Leaves: Alternate, simple, short-stalked below, sessile above, lanceolate to ovate-lanceolate, 1 to 8 inches long, 1/4 to 2 inches wide, glabrous or rarely hairy; margins toothed; tips pointed; upper leaves reduced. Inflorescences: Racemes, many flowered, 4-28 inches long, terminal, each node 1-flowered. Flowers: 5-lobed, bright red, 1 to 1.75 inch long; calyces bell-shaped, strongly ribbed, glabrous or sparsely bristly; 3 lower corolla lobes narrowly ovate to elliptic, bent downward and spreading; 2 upper corolla lobes erect, linear-lanceolate, slightly smaller than lower lobes; stamens 5, filaments red, anthers gray, united, forming straight or slightly curved tube around style. Fruits: Capsules, cup-shaped; seeds numerous, tiny, chestnut-brown. Habitat: Wet sites with partial sunlight, stream banks, marshy areas, and moist thickets. 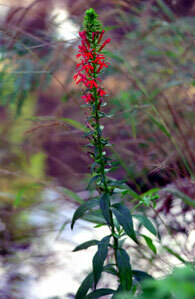 Toxicity: The leaves, stems, and fruits of cardinal flower can be poisonous to livestock. Uses: In the 1800s, lobelia species were used medicinally to treat nervous disorders, convulsions, asthma, and tetanus. Blue lobelia is related to blue lobelia (Lobelia siphilitica).